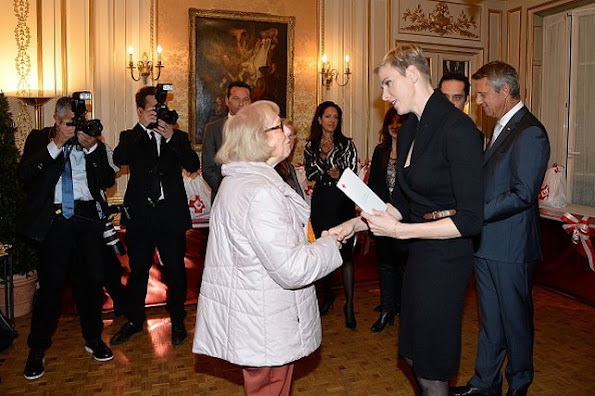 Prince Albert II of Monaco and Princess Charlene of Monaco attends parcels distribution at the Monaco Red Cross headquarters on November 17, 2015 in Monaco. Charlene looks way younger than before, lovely Lady. jealous brits, who has outshone their golden girl kate middleton, charlene looks young and fresh, viva charlene!! Wow, Charlene has changed a lot lately. I love short hair on women, it can look very feminine. In Charlene's case I am not sure, she is too athletic and looks almost masculine in some angles. Les lunettes de soleil sont- elles greffées sur la tête ? On dirait que oui! Je trouve que sa coiffure ne lui va pas du tout, va-t'elle se raser la tete comme pas suivant ? I realize she is trying to appear pious by showing attending mass but It is inappropriate to wear a rosary as jewelry. It is actually frowned on and Even our bishop wrote a letter on it. It is not a fashion statement (aka Kim Kardashian wearing one). It is disrespectful and she should know better! She was so beautiful. Why all these fillers and Botox? She looks gaunt and her smile never reaches her eyes because she is expressionless. Vanity and exercising on the beach for show while living outside the country should be replaced with learning French and attending more events in Monaco. Ce n'est pas un chapelet, mais un collier de perles que Charlène a déjà porté, en autre lors du Pic- Nique des Monégasques de 2011. As noted in French above, it is a pearl necklace, worn in other appearances before. The spacing in it is not unusual in France. I have a similar style. And I am also Catholic and can recognize a rosary vs. a necklace. I don't believe they are attending mass or that she is attempting to appear pious or otherwise. They are at a Red Cross event at the head quarters. she is dressed appropriately, if somewhat somberly, but respectful of the events of the last few days in neighboring France. I was unaware she did not know French after her years in Monaco but I bow to your inside knowledge. She seems to make numerous appearances of late in her role as princess but she is also the mother of two babies. I don't claim to know her motivations for exercising but it has been widely reported they are staying at one of their country homes just outside the principality while the renovation are ongoing in the palace. I believe lead and asbestos were among the reasons. Seems sensible with infants though I believe both Princess Grace and Princess Caroline raised their children largely at their country homes. Honestly, who would care as long as she and her husband are satisfied. The people of Monaco seem to be very happy with her and she well spoken of whenever I have been there. I'm puzzled by the level of vitriol and personal condemnation toward her on the remarks. She looks so stylish, so clean, so fantastic, glamurous and modern and with this short cut very unique between all the other royals with the same hairstyle. Congratulations - Looks great! Agreed, Charlotte and Anon 17:35. This new haircut is growing on me, the more I look at it. Of the younger royals, Charlene has always had the most avantgarde style. Just when I think she has become more conservative, she surprises us with something edgy like this. A textbook Charlene move. Guaranteed to provide food for thought. ya jealous of charlene, so what if shes using botox, and how do you know that, shes i the epitome of class whether you like it or not!! Why to have hair at all ? With her wide arms and masculine look more hair would make her look more feminine. I doubt any man would like such a hairdo on any woman. You must be a man, because no self-respecting woman would write such a comment. I find it really sad to read in this day of age. @ Anony... 21:45 , You are wrong I am a woman young age and with plenty of long hair on my head! @Anony...21:45 what liking of hairdo style has to do with "self-respecting" ? It is the "I doubt any man would like..." part I'm commenting on. A hairstyle should not be chosen based on whether "men would like it". Think about it. too young and too old...........too "salza"..........maybe velvet and silk are her materials. I don't like her new hair style!!!! It looks as if she cannot find her own style. It's not up to you. Charlene has the poragative to wear her hair just the way she want. We change haircuts alle the time, why can't they? Um, no-no-no Charlene, not a good look. Anonymous21:45 I am not a man and I agree with Anonymous19:51 whom you criticized. Before marriage she looked much more feminine. I think Princess Charlene is a very pretty woman, but this new pixie haircut is way too severe for her strong facial features. Perhaps after it grows out a bit it will frame her face better, but right now it makes her look "plastic". This haircut is not feminine and is not suitable for the princess, what a pity, she's so pretty! Short haircut and much too short haircut are two different things. We even saw Diana with hair so short that she had shaved her neck so come on! Had she been a live and still married to Charles she would have been the first to try out this look. I like the fact she is enough brave to try an unconventional cut . As someone said here, she tries to be different . Good. On the other hand , all that plastic surgery and botox are really ridiculous. Stop please, before it's too late, and don't destroy your face , you really don't need it . Short, well-cut hair looks OK on a lot of women, but this awful "short-back-and-sides" should be reserved for policemen and army recruits.. Besides, the shaved sides show off her ears, which are, well.. not small. A very bad look. Is she planning to join the marines? @Shellsea, I agree totally with you. This one who invented that kind of hair cut should be shot! Haircut should add to the beauty of the face not to take away. Both Charlize Theron, another South African, and Sharon Stone have worn the same style with great success (with both also being tall, athletically built woman as well). I find it flattering to her features and she has the makeup tuned to a good level to avoid a 'mannish' look. Her eyes look incredible where I never have noticed them before. As a mother with two young babies (regardless of how much help) it has got to be easier and more comfortable with little grabbing fists. I notice she has been avoiding wearing earrings of late too- possibly for the same reason. Sometimes practicality rather than making a statement is behind a change. She seems to smile more toward the individuals she is interacting with than for the cameras at large and more relaxed. Her makeup in the second image is very flattering , enough but not too much- great lipstick color on her pale skin. She's avoiding the perma-tan so many others do. Also, I know many Catholics that wear religious medallions but I see indication in these pictures that the beaded necklace is a rosary (and yes I am Catholic and familiar with them). I have seen similar spacers in regular pearl necklaces in France and Italy particularly. The black dress is by Gucci, I think, and whether it and the boxy coat are 'boring' to some, she looks comfortable in them and appropriate. Not loving the brown shoes with the black tights but I get it is to tie in to the brown leather straps of the wrap dress. 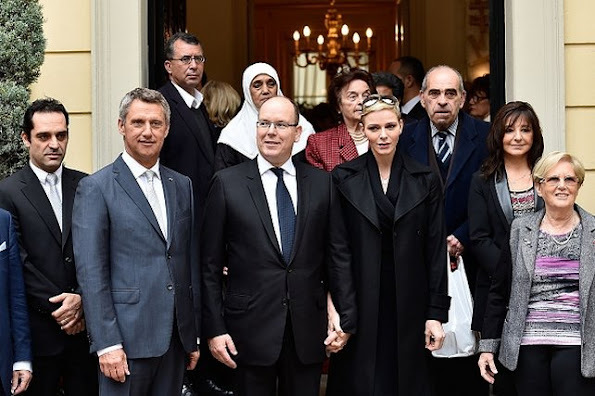 Given the Grimaldi female attire in general, I can appreciate an err in caution against the more 'vivid' taste of, say, Princess Stephanie at official events. But so much nicer if we can focus on the fact she seems smiling and happy in her role, one on one with the recipients, than tearing her apart for her style choices. "See no indication" that it is a rosary, I mean. I think several French commentators identified it as a previously worn pearl necklace. Charlene is very beautiful, she has beautiful blue eyes and she has a wonderfull body that a lot of women would like to have, it is why we saw so nasty comments of jalious women. She was giving gifts to poor ederly persons at the Red Cross center, the persons seemed very happy to meet her. Short hair or long hair, it is not the affair of these persons who are criticing her, she is wearing a medal of Sainte Devote and perhaps a rosary, she is a pious person and it is her own believing we have not to critic the believing of a person. and as mother, she is a doted mummy, she never left her children, she is looking after on them every time, she is always with them, she never left them, we don't see her alone in holidays but with her children and she brought them to the mass at PortoVecchio, it is a shame to read these critics, I think that all the comments come from only one persons who is writtiing a lot of comments to make think that there are a lot of comments about her. No, I don't want to have her manly body I'm very happy with my own. But of course it's not allowed to criticize holy Charlene if you do you are just mean and jealous. Charlene should simply do her job as Princess of Monaco. She doesn't have to be around her kids 24/7 she has two nannies and a night nurse and her kids are nearly a year old. What do poor working women do?! We haven't seen her for months while she has been in Corsica. She only returned to Monaco for National Day and I suppose she'll disappear again after that. She doesn't do anything for Monaco but she lives off Monaco (and her whole family too) this is unacceptable IMO. Imagine other royals doing this... Charlene has never worked properly since (and also before) the wedding she is simply lazy. Mi opinión libre es que se ha hecho demasiadas cirugías que han estropeado un rostro tan hermoso en otro tiempo.El cabello tan corto no le favorece porque endurece sus facciones y las masculinisa. Y sí, ( como alguien dijo ya) no estaría de más que hiciera esfuerzos extra con la lengua francesa , porque en tanto tiempo como ya vivió en el Principado, y hasta ahorita no domina el idioma. Se me hace raro, raro. Sorry to say this but the haircut is terrible, way too short. It was just starting to grow a little and looked so much softer. This look is not good even for her and she can wear short hair better than most. What was she thinking?? She looks amazing in her new hairdo! charlene looks AMAZING shes got twins to look after and her job, so this is convenient and cute, we dont want another mop of extensions and wiglets, flying all over like kate middleton!! het is een zeer elegante prinses,ieder ze mening, maar ze doet haar eigen zin ,en dat vind ik heel knap.!!! dat schrijft een krant,en ik ben het helemaal eens !!! !